Fire This Time! Mural by Don Miller in Washington, D.C.
can be no victory over a people who will fight until their last breath against foreign invaders. UN data. At least 1,601 civilians were killed. Nearly all the deaths – 1,509 of them – were children. The US and NATO will never destroy the Afghan resistance. However, they can – and have – destroyed millions of Afghan lives. At least tens of thousands of Afghans have lost their lives in the war. In fact, the number of victims is more likely in the hundreds of thousands, but accurate records have never been kept. These victims leave behind children that will grow up without a mother or father, parents who will never again hear the sweet laughter of their child, brothers and sisters with whom they will never again play. Today, 623,000 Afghans are internally displaced, forced to abandon their homes due to lack of security or ability to find work to feed their families. The United Nations predicts this number will increase by 450,000 in 2017. In addition, the UN expects nearly a million refugees who have been living in Pakistan to be forced to return to Afghanistan later this year. This would leave nearly 10% of the Afghan population without homes. U.S. plane attacked the Doctors Without Borders hospital in Kunduz, Afghanistan killing 42 patients and health workers and injuring many more. 2015.
in the country, which will advance their strategic and economic goals in the region. If there is to be an end to this long war, it will be because we the people in the US, Canada and around the world fight for it. Around the world, the sleeping giant of poor and working people demanding justice has begun to rise. We have many battles to fight, but surely one of those battles must be for the liberation of Afghanistan from foreign occupation. For sixteen long years, the Afghan people have been fighting the very same governments which have been cutting away at our rights and freedoms in our own countries. We owe the Afghan people our active support and struggle against this brutal and unjust war. Afghan children line up for food at Maslakh refugee camp near Herat, Western Afghanistan. exposure in refugee camps during the bitterly cold Afghan winter, adding to the death toll of this brutal war. Health care in Afghanistan also remains in crisis, with hospitals chronically understaffed and underfunded. A 2014 report by Medcins Sans Frontieres found that one in five Afghans had a close friend or relative who had died within the previous year due to lack of access to medical care. Women’s health care remains particularly poor, with the maternal mortality rate still one of the highest in the world. The crisis in women’s health is greatly exacerbated by war: many women are forced to starve or go into prostitution to feed their children if their husbands die. Others become opium addicts or attempt suicide in an attempt to escape their desperate conditions. The number of women addicts as well as the number of women who attempt suicide has been rising year over year. The Afghan education system – which the US government hailed as one of its great ‘successes’ – has been exposed by numerous reports to be a sham. “The few schools that did get up and running were dangerous, ramshackle buildings with fewer students—especially fewer girls—than official records attest,” Bonnie Kristian wrote for Foreign Policy magazine in September 2016. Battle of Ideas Press War and Occupation in Afghanistan Which Way Forward? By Nita Palmer Nita Palmer is an author and researcher on the war in Afghanistan. She is a member of the editorial board of Vancouver, Canada-based social justice newspaper Fire This Time. In response the speakers urged that we cannot accept “business as usual” when we are seeing the terrible consequences both of the these human rights violating “anti-terrorism” laws, and of the racism and islamophobia used to justify their existence. The movement to Repeal Bill C-51 must continue to spread out, connect with the many diverse communities negatively impacted, and continue to educate, organize and mobilize to defeat this dangerous, unjust and unnecessary legislation. The Working Group to Stop Bill C-51 is committed to do everything within its power to Repeal Bill C-51. Everyone is incited to join us during our weekly actions to continue the fight! We will not stop until the law is gone. Clockwise from top: Cuban Students rally at University of Havana; Josephina Vidal, Cuba's top diplomatic negotiator with the U.S. and foreign ministry department head; U.S. President, Trump / Cuban President, Raul Castro. retiring in 2013. From the 1970s to the 2000s, Alarcón led secret talks with US officials through a backdoor channel that was first opened by Che Guevara in 1961, just eight months after diplomatic relations had officially been broken off. Whether this historical willingness to engage in discussion is continued under JANUARY 1 TO MARCH 1 2017 Trump will depend on whether the new president takes a pragmatic economic THIS IS WHAT PEOPLE ARE approach or a confrontational political brought first-hand reports from activities SAYING AND WRITING ABOUT and conferences, on topics such as the war line. on Yemen and the Middle East, the struggle against the Dakota Access Pipeline, freedom for political prisoners in the U.S., as well as Venezuela and Cuba solidarity initiatives. But now we really need your help! One time donations and monthly sustaining donations are gratefully accepted! Any donation of a total of $250 or more will receive a bound volume of all 12 issues of next year’s Fire This Time newspaper! It’s also important for you to know that you can pledge big or small donations to be paid over a period of time as well. Rafael Hernandez, the director of Temas, FIRE THIS TIME an influential journal of political and social debate published in Havana, believes Trump’s business instincts will prevail over the threats. 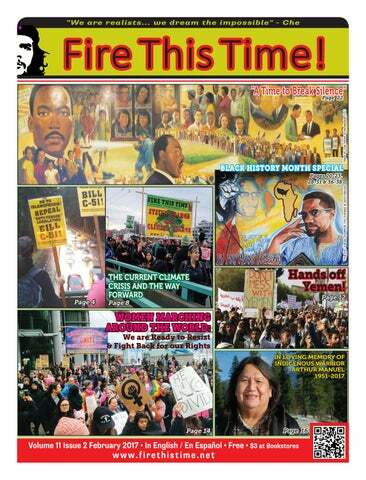 bold & great a n a l y s i s "
Dear Fire This Time Reader, Fire This Time Newspaper is an independent newspaper which reflects the interest of working and oppressed people and believes that every international fight is local and every local fight is international. Good news! Donating is easy! arrests since the Standing Rock Sioux and their allies set up a camp to stop the construction of the Dakota Access pipeline. More than 15,000 people were present when the camp was at its largest, and they were able to force the Obama administration to halt construction and order an environmental review of the project. They are now attempting to bypass this completely as the US Army Crops of Engineers has just issued the final “easement” allowing drilling to start immediately. continued from page 7 " Top diplomatic negotiator in Cuba warns Trump"
citizenship within one year. Although commercial ties are minimal and financial restrictions remain in place, Obama used his executive powers to grant licences to selected US companies to operate in Cuba: six telecoms, four cruises, one hotel, eight airlines and two small banks. In mid-December, Google signed a deal with the Cuban government to install servers on the island that will speed up access to the internet. On the eve of Trump’s inauguration, the first legal Cuban export to the US in more than 50 years will take place, in the form of 40 tons of charcoal produced in Cuban cooperative farms. As they wait to see how much of this will be dismantled or continued by Trump, Cuban official stress the benefits of closer ties with the US go far beyond the island’s borders. ‘These last two years show that many good things have been done not only for Cubans and for the Americans, but for others,” Vidal says. “Because when Cuba and the US cooperate in confronting drug trafficking, this is an important contribution to the region; or when Cuba and the US cooperate in confronting [viruses such as] zika, dengue and chikungunya, as we have been doing recently, we are making an important contribution to humanity. When Cuba and the US cooperated in Africa to fight Ebola, they made an important contribution to the health of the world.” But nothing is taken for granted. The Cuban Communist party’s longterm development plan circulated for debate after the seventh congress in April 2016 makes no assumptions about changes in US policy toward Cuba. Raúl Castro has asserted the need for “civilised coexistence” with the US, but not at the cost of sovereignty and independence. An earlier proposal to block all metals mining in El Salvador has stagnated for years in Congress without being discussed. The movement against destructive mining activity in El Salvador received a boost Monday as leaders of the Catholic church in the Central American country presented a bill in Congress aimed at blocking mining and protecting citizens from “serious contamination.” “The objective of the bill is to protect our country and its population from serious environmental contamination, especially of water, an inevitable consequence of open pit mining exploitation,” the archbishop of San Salvador, Jose Luis Escobar Alas, said in a press conference Sunday. The religious leader of the Catholic-majority country stressed that there must be legislation to outlaw mining in order to ensure the negative consequences are avoided in the future. Escobar added that he hopes lawmakers support the proposal and propel the bill into law. But it’s not the first time such a bill has been brought forward in the Congress, and the latest proposal is likely to continue to face an uphill battle in the conservative-dominated assembly. In 2013, a national coalition against metals mining presented a bill designed to prohibit the activity, but it has still not been discussed in Congress. Proposed legislation to protect water rights in El Salvador has similarly faced resistance from conservative factions that have long showed staunch support for private interests. The conservative opposition in Congress — made up mostly of the right-wing Arena party that governed the country for two decades until the progressive FMLN won the presidency in 2009 — has long stalled a proposal to adopt a General Water Law aimed at protecting the right to water and regulating corporate use of the resource. nomic hardship and makes access to everything from medicines to sports equipment very difficult. With Obama making one of his final acts as US president to deal another blow against Cuba instead of trying to make progress on lifting the blockade, we can see that Obama’s motivations were never based on fairness or justice. In Vancouver, Canada and around the world, Cuba solidarity activists knew from the time of Obama’s December 2014 announcement that this signaled an opportunity, not an inevitability, for the blockade to be lifted and that it was more important than ever to put the pressure on the US to end the blockade. Now with Donald Trump as US president, the necessity to organize in solidarity with Cuba for an end to the blockade is even more critical. Back on November 28th 2016 Trump tweeted that if Cuba doesn’t make a better “deal” that he would “terminate deal”. On February 3rd, 2017 US Press Secretary Sean Spicer notified the press that the administration is “in the midst of a full review of all U.S. policies towards Cuba”. Clearly neither of these statements are positive for moving towards lifting the US blockade on Cuba. Movement for Social Justice Venezuela Solidarity Campaign has been holding monthly protest actions since December 2015, and were out on the streets again on January 6th, 2016. Activists first gathered for a picket action in front of the US Consulate in Downtown Vancouver, raising picket signs and voices to demand “US Hands Off Venezuela!” After rounds of picketing and hearing from speakers, protesters moved to in-front of the Vancouver Art Gallery to setup a petition drive and informational display declaring “Maduro is our President”. Passers-by on the busy downtown streets stopped at the table to pick up information and talk with organizers, and teams of petitioners collected signatures deOF manding that the US government stop its sanctions and interference in Venezuela, including revoking Obama’s Presidential Decree which labels Venezuela as an “unusual and extraordinary threat to US national security”. Whatever president is in office in the US, Friends of Cuba Against the US Blockade is committed to continue organizing for the US blockade to be lifted and for Guantanamo to be returned to Cuba. Join FCAB on the 17th of every month in front of the US consulate, marking the day of Obama’s December 17th 2014 announcement of normalization which has yet to be realized. For more info a nd upcoming events check out http://vancubavsblockade.org or follow on Twitter @NoBloqueoVan End the Blockade on Cuba Now! Return Guantanamo to Cuba Now! US Government Stop the Campaign of ‘Regime Change’ in Cuba and Immediately Stop Interfering in Cuba’s Sovereignty and SelfDetermination! Against the US Blockade – Vancouver (FCAB-Van) formed soon after Obama’s 2014 announcement in order to organize against the US blockade on Cuba as the new door of US/ Cuba negotiations opened. On January 17th, 2017 FCAB organized its monthly protest action which month after month has been bringing protesters out in-front of the US consulate. Cuba solidarity activists picketed and chanted with the demands of “Lift the Blockade on Cuba Now!” and “Return Guantanamo to Cuba Now!” In between rounds of picketing, protesters heard from local speakers as well as a solidarity phone message from Ottawa Cuba Connections, who on the same day also hold monthly picket actions against the US blockade in front of the US Embassy in Ottawa. access to medical care. Less than half of health facilities are functional.” The Saudi-led coalition has targeted hospitals and healthcare facilities with its airstrikes and bombing. Trump has continued Obama’s legacy of drone war on Yemen. In his first three days as the new President of the United States, the U.S. military carried out 3 drone strikes in Yemen as part of their so-called fight against terrorism. This so-called Joint Incidents Assessment Team (JIAT) is basically a mockery of independent investigation! Since its creation in January 2016, the JIAT, has only investigated 14 airstrike incidents that were reported and condemned by the UN and other international human rights organizations. The Joint Incidents Assessment Team cleared the Saudi-led/U.S.-backed coalition of any wrong doing in 10 and acknowledged “shortcomings” in 4 of the airstrikes, of course as a cover to try to legitimize their reports. Saudi Arabia would not have been able to carry on its brutal and criminal military campaign against Yemen without the backing and full support of the United States government and its imperialist allies. Saudi Arabia and the U.S. don’t have the well being of Yemenis in mind. They are following their own strategic interest in the region. The U.S. and its imperialist allies aim to regain their grip over Yemen and further expand their hegemony over North Africa and the Middle East. The new Trump administration is no different than its predecessor. “We are very, very optimistic about the Trump administration. And on working closely with it to deal with the many challenges, not only in our region, but in the world,” Saudi Foreign Minister Adel bin Ahmed al-Jubeir said during a news conference in Riyadh on January 24, 2017. On January 29, 2017, Donald Trump ordered his first military raid in the Al Bayda Governorate in Yemen, conducted by American and Emirati Special Forces. The U.S. claimed they were attacking a suspected Al-Qaeda camp. The raid was a complete disaster, claiming the life of a U.S. Navy Seal and over 30 people, including 10 women and children. only during the last 8 years of Obama’s presidency. As peace loving people living in North America we need to stand up and defend the right of the Yemeni people to their own future without foreign intervention. Here in Canada for example, we need to continue to hold the Canadian government accountable for their support of Saudi Arabia and demand a cancelation of Canada’s $15 billion arms deal to supply Saudi Arabia with armored military vehicles. The Yemeni people have showed bravery and courage in their resistance to the Saudi-led aggression on their country. Let’s join them in fighting for their right to life, freedom and sovereignty. US/Saudi Arabia Hands off Yemen! Stop Bombing Yemen! Lift the Naval, Aerial and Land Blockade on Yemen! marching, rallying and chanting, estimates take the numbers to 5 million protesters from 700 demonstrations world wide. While many picket signs and demands at the Women’s March were directed against Trump, women’s oppression did not start with Trump and there is a lot more than one man that stands in the way of women’s liberation. However Trump’s brazen disregard for women’s rights and the fact that a man at the highest position of power in United States is threatening the hard fought gains women have made was a catalyst to bring women, and men as their allies, to their feet and to the streets. What really brought women to the streets is lifetimes and countless generations of inequality, sexual violence, domestic abuse and exploitation. be considered that of every 100 incidents of sexual assault in Canada, only 6 are reported to the police. Often this is domestic abuse, and world wide up to 70% of women experience physical and/ or sexual violence by an intimate partner at some point in their lives. Despite these horrific figures, in the US, Trump is considering cutting funding for Violence Against Women Act (VAWA) grants. As it stands, funding for domestic Women's March in Mexico City, Mexico violence programs in the US is already insufficient. In 2015 the National Network to End Domestic Violence reported 12,000 inquiries for domestic violence services that could not be fulfilled due to a lack of resources, meaning women could not access vital resources such as know that Women's March in Accra, Ghana attaining safe all the rights they shelter, legal currently have, from services, reproductive rights to transportation the right to vote and assistance work, are hard fought and childcare. for rights and in many It is with parts of the world the weight are still being fought of all these for. We are eternally injustices, indebted to the long and arduous struggles Women's March in Vancouver, Canada by the women who came before us. However we cannot take these gains foregranted - we must fight tooth and nail to maintain and extend these rights as they are constantly under threat. major Aboriginal organizations in Canada? AM: I think the main significance of it was that the Canadian government has been able to basically co-opt our national Aboriginal organizations into a strategy to deal with the symptoms of poverty as opposed to trying to deal with the cause of our poverty. Indigenous people at the grassroots level, especially the ones who have gathered here in Kelowna, have always been struggling with the federal and provincial governments with regards to Aboriginal title and Aboriginal fishery rights. And we’ve always been demanding the government recognize Aboriginal treaty rights, but that is not being done. North America and around the world in his unwavering and relentless efforts to champion the cause of our Indigenous Rights. He relentlessly worked on land claim issues, calling for change to Canada’s fundamental flawed policy on Indigenous land claims. On behalf of our Elders, Leaders and Chiefs, we offer our sincere sympathies and condo- At this terribly sad moment in our history, we lences to the Manuel family with respect to would like to thank the Manuel family for shartheir tremendous loss. ing Arthur with us for all these years. Arthur served for many years as Chief of the Neskonlith Indian Band, Chair of the Shuswap Nation Tribal Council and Leader and Spokesperson for the Interior Alliance. He was a member of the UBCIC’s Chief Council. Most importantly, he was a good father and a wonderful grandfather who was devoted to them all, spending as much time with them as he could. We are so profoundly grateful for Arthur’s many sacrifices and contributions to our ongoing struggles to seek a full measure of Justice for our Indigenous Peoples. question it. The issues that are so critical now, are the land issues. That conference over there happened because the province and the federal government are scared. That’s why it’s happening. It’s because the legal rights that we have been acquiring and accumulating over the centuries are being heard reporters and media in New York, and people who validate Canada’s credit rating. They know that Indian people are a substantially high hidden cost that Canada has been hiding. The other doctrine you need to put in this perspective, and this gets really complicated, is the financial statements of Canada with reference of Aboriginal liabilities with regard to Indian land and treaty rights. And also the province, the same thing, the financial statements. We’re actually in page 60 of the BC financial statements under what they call ‘contingency modes and liabilities’ and they sort of highlight the whole thing about Canada’s BC treaty process in there in about four or five paragraphs. They highlight it. They have to highlight it because they need to let the people who lend BC money, the international investment banks, they need to let them know what all their liabilities are, and we are one of them as Indigenous people, and we have to tell them. In this agreement, we’ll end up in their next financial statement saying we got this thing, because what they need to show to the financial investment banks out there is that ‘we’ve got the Indians under control. We’re managing them.’ I know that in their present statements, they say that ‘we’re lending them money to negotiate, and two-thirds of them are negotiating, but we don’t expect an agreement in the foreseeable future.’ They say that right in their financial statements, you know what I mean? The reason they do that is because they are using our land as collateral to borrow the money that they turn around and give us the $100 million, which is real chump change when you talk about the deficit of some of these companies. General Motors runs a $4 billion deficit on its GM plant in Canada. It’s nickel and dime when you really nail it down to corporate interests, and here is our leadership thinking it will mean big change. It ain’t going to help nobody. State” solution is not in their interest or desire. the Israeli Zionist regime and its policies on both the Jewish and Palestinian sides. The solution the people of Palestine and their Jewish sisters and brothers need is not a solution of division but one of unity. The state of Israel and its racist Zionist ideology have been the creator and enforcer of the Palestinian problem and division between the two peoples. At Chicago O’Hare airport during mass protests against Trump’s Muslim Ban, protestors brought down the Israeli flag at the airport and raised the Palestinian flag in its place as a show of solidarity with the struggle of Palestinians. Jews and Muslims stood together in protest of Trump’s inhumane ban. Just hours after Trump implemented the ban the Victoria Islamic Centre in Texas was burned to the ground. Robert Loeb, president of the Jewish temple near by visited the Islamic centres founder and handed him the keys to the Jewish synagogue so their Muslim sister and brothers would have a place to worship. And examples like this are spreading. Now is a time for coming together regardless of religion, ethnicity or any other human identity used to divide. Palestinian people and Jewish people could live together on the same land, under the same flag and united in a single state called Palestine. With the Right of Return granted to the more than 6 million Palestinian refugees living abroad who were cleansed from their land, each individual would be granted the right to vote and organize democratically, together a better future for all. Instead of Israel being recorded in history as one of the great errors of humankind, perhaps Palestine could be recorded as one of the great achievements as a people coming together against the odds for a safer, cleaner, and better world that we all deserve and desperately need. By Martin Luther King Jr. Excerpt of speech delivered by Dr. Martin Luther King was given on April 4th 1967, precisely one year before Dr. King’s assassination on April 4th 1968, in Memphis, Tennessee. In this important speech Dr. King portrays the latest development of his political vision and gives a comprehensive analysis of US imperialist war drive in Indochina, specifically in Vietnam. Dr. King also connects the war the imperialist ruling class were conducting in Vietnam to the war against Afro-American and other oppressed people in the United States, like the restriction of democratic rights, poverty, and racism. us to see the enemy’s point of view, to hear his questions, to know his assessment of ourselves. For from his view we may indeed see the basic weaknesses of our own condition, and if we are mature, we may learn and grow and profit from the wisdom of the brothers who are called the opposition. Protesting the War Meanwhile we in the churches and synagogues have a continuing task while we urge our government to disengage itself from a disgraceful commitment. We must continue to raise our voices if our nation persists in its perverse ways in Vietnam. We must be prepared to match actions with words by seeking out every creative means of protest possible. There is something seductively tempting about stopping there and sending us all off on what in some circles has become a popular crusade against the war in Vietnam. I say we must enter the struggle, but I wish to go on now to say something even more disturbing. The war in Vietnam is but a symptom of a far deeper malady within the American spirit, and if we ignore this sobering reality we will find ourselves organizing clergyand laymen-concerned committees for the next generation. They will be concerned about Guatemala and Peru. They will be concerned about Thailand and Cambodia. They will be concerned about Mozambique and South Africa. We will be marching for these and a dozen other names and attending rallies without end unless there is a significant and profound change in American life and policy. Such thoughts take us beyond Vietnam, but not beyond our calling as sons of the living God. and computers, profit motives and property rights are considered more important than people, the giant triplets of racism, materialism, and militarism are incapable of being conquered. A true revolution of values will soon cause us to question the fairness and justice of many of our past and present policies. True compassion is more than flinging a coin to a beggar; it is not haphazard and superficial. It comes to see that an edifice which produces beggars needs restructuring. A true revolution of values will soon look uneasily on the glaring contrast of poverty and wealth. With righteous indignation, it will look across the seas and see individual capitalists of the West investing huge sums of money in Asia, Africa and South America, only to take the profits out with no concern for the social betterment of the countries, and s a y : “This is not just.” It will look at our alliance with the landed gentry of Latin America and say: “This is not just.” The Western arrogance of feeling that it has everything to teach others and nothing to learn from them is not just. A true revolution of values will lay hands on the world order and say of war: “This way of settling differences is not just.” This business of burning human beings with napalm, of filling our nation’s homes with orphans and widows, of injecting poisonous drugs of hate into veins of people normally humane, of sending men home from dark and bloody battlefields physically handicapped and psychologically deranged, cannot be reconciled with wisdom, justice and love. A nation that continues year after year to spend more money on military defense than on programs of social uplift is approaching spiritual death. We are now faced with the fact that tomorrow is today. We are confronted with the fierce urgency of now. In this unfolding conundrum of life and history there is such a thing as being too late. Procrastination is still the thief of time. Life often leaves us standing bare, naked and dejected with a lost opportunity. The “tide in the affairs of men” does not remain at the flood; it ebbs. We may cry out desperately for time to pause in her passage, but time is deaf to every plea and rushes on. Over the bleached bones and jumbled residue of numerous civilizations are written the pathetic words: “Too late.” There is an invisible book of life that faithfully records our vigilance or our neglect. “The moving finger writes, and having writ moves on...” We still have a choice today; nonviolent coexistence or violent co-annihilation. We must move past indecision to action. We must find new ways to speak for peace in Vietnam and justice throughout the developing world -- a world that borders on our doors. If we do not act we shall surely be dragged down the long dark and shameful corridors of time reserved for those who possess power without compassion, might without morality, and strength without sight. Now let us begin. Now let us rededicate ourselves to the long and bitter -- but beautiful -- struggle for a new world. This is the calling of the sons of God, and our brothers wait eagerly for our response. Shall we say the odds are too great? Shall we tell them the struggle is too hard? Will our message be that the forces of American life militate against their arrival as full men, and we send our deepest regrets? Or will there be another message, of longing, of hope, of solidarity with their yearnings, of commitment to their cause, whatever the cost? The choice is ours, and though we might prefer it otherwise we must choose in this crucial moment of human history. peoples means for life, they have also taken away the hope that the violence and destruction will someday end. This horrible fact is illustrated clearly in the refugee arrivals to Europe in 2016 - over 40% of the refugees were from only three countries: Syria, Afghanistan and Iraq (UNHCR). This crisis for humanity, one that has driven so many people to risk their own lives and that of their families, is not over. 2017. Institutionalization of Islamophobia How is it possible for governments like the U.S. and Canada to get away with such backward immigration and refugee policies? Part of it is the same reason they are able to get away with carrying out their bloody wars in the Middle East and North Africa: fear-mongering and the propagation of Islamophobia. Now, the U.S. travel and refugee ban has taking this campaign one step further, it has institutionalized Islamophobia in the United States. No matter how many people are challenging it in court today, there is now another layer of explicit immigration policy to back up the bigotry and violence that has been growing against Muslim people in the United States since the U.S. “war on terror” began after 9/11 and the invasion of Afghanistan in 2001. This is not the first time in U.S. history that fear and hysteria have been used by the United States to keep people divided and unable to fight for their rights. Under both Democrats and Republicans, the U.S. government has used fear as a tool to control poor, working and oppressed people. Immigrants and refugees have often been the scapegoats for a whole host of economic and social crises in the U.S. There are more than a few examples: The U.S. banned Chinese immigration with multiple pieces of legislation beginning in the 1880’s, at the same time restricting the rights of Chinese people already living in the United States. In 1921, after World War I, Congress restricted immigration from Eastern and Southern Europe. During World War II and the Holocaust, the President of the United States stated that refugees fleeing the Nazi’s were actually a threat to U.S. national security and entire boats of mostly Jewish refugees were turned back to Europe after reaching the United States. The list goes on to include the banning of people for their political beliefs and even their HIV status. The government of Canada is also no stranger to these same tactics. orientation, to build a better world. This is what I want to talk about today. Since his passing response throughout the world has been deeply divided about Fidel’s legacy: was he a visionary revolutionary who fought for a better world or a cruel communist dictator? I should be very clear that I am very biased on this issue and I believe that Fidel was a very important revolutionary leader and I will be talking today mostly about his role in Cuba, Africa and with people of African descent. The Cuban revolution Cuba has had many leaders and heroes, as our Emcee Peter mentioned, of African descent throughout its history. One of the most important was Antonio Maceo, they called him the Bronze Titan because of his skin colour. 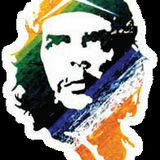 He was a very important leader in the 1800s against Spanish colonialism in Cuba and also against slavery. But the more recent Cuban revolution in 1959, also had many afro-Cuban involved in its leadership, from Juan Almeida, to Victor Dreke, to Harry Villegas. battle in Angola. In the end, Cuba and the people of Angola won the battle at Cuito Cuanavale. This weakened the South African Apartheid army severely. To the extent that in 1995 Nelson Mandela of Cuba and the battle of Cuito Cuanavale, “the defeat of the racist army at Cuito Cuanavale has made it possible for me to be here today.” Meaning that Nelson Mandela believed that he never would have been released from prison and that he would not have become President of South Africa, without the battle that Cuba and Angola fought together in 1987. Cuban schoolchildren, happy and healthy! sending soldiers as they did to Angola or the Congo, but for sending doctors. Cuban doctors have also played an important role in Haiti after the earthquake there in 2010 and most recently after Hurricane Matthew in October 2016. In many ways, the vision of Fidel Castro changed over the last couple of decades, believing that the most important thing that Cuba could give to the world was health. That it is with health, education, and proper nourishment that new liberation fighters will be born and more people will be able to educate themselves and come to the conclusion that the people of the world deserve a better world and a better future. Por otra parte, un retorno del neoliberalismo incrementaría la pobreza y el desempleo, agravando así las condiciones sociales en la América Latina y el Caribe. Señor Presidente: Reiteramos nuestro apoyo al pueblo y gobierno venezolanos en la defensa de su soberanía y autodeterminación ante las acciones contra la Revolución Bolivariana. Seguiremos contribuyendo en la medida de nuestras posibilidades a la implementación del Acuerdo Final de Paz entre el Gobierno de Colombia y las FARC-EP y apoyando las conversaciones de paz con el ELN. hermanas naciones caribeñas ante los intentos de privarles del acceso a recursos financieros, en el enfrentamiento al cambio climático, y en su reclamo legítimo de reparación por los daños del colonialismo y la esclavitud. Reiteramos nuestro aliento a los esfuerzos de la República Argentina para recuperar las Islas Malvinas, las Georgias del Sur y las Sandwich del Sur. Estimado Presidente: Deseo expresar la voluntad de Cuba de continuar negociando los asuntos bilaterales pendientes con Estados Unidos, sobre la base de la igualdad, la reciprocidad y el respeto a la soberanía y la independencia de nuestro país, y de proseguir el diálogo respetuoso y la cooperación en temas de interés común con el nuevo gobierno del presidente Donald Trump. Para ello, es indispensable que todos los miembros de la comunidad internacional respeten plenamente los postulados de la Proclama en sus relaciones con los países de la CELAC. Sería deseable que el nuevo gobierno de Estados Unidos opte por el respeto a la región, aunque es preocupante que haya declarado intenciones que ponen en riesgo nuestros intereses en las esferas del comercio, el empleo, la migración y el medio ambiente, entre otras. El bloqueo e c o n ó m i c o , comercial y financiero persiste, lo que provoca considerables privaciones y daños humanos que lesionan gravemente nuestra economía y dificulta el desarrollo. Para alcanzarla, se requiere un estricto apego a la Proclama de la América Latina y el Caribe como Zona de Paz, firmada por los Jefes de Estado y Gobierno en La Habana en enero de 2014, en la que nos comprometimos ‘con el estricto cumplimiento de su obligación de no intervenir, directa o indirectamente, en los asuntos internos de cualquier otro Estado,’ y a resolver las diferencias de forma pacífica, así como a ‘respetar plenamente el derecho inalienable de todo Estado a elegir su sistema político, económico, social y cultural’. inherentes a su soberanía e independencia. Nunca ha sido más necesario marchar efectivamente por el camino de la unidad, reconociendo que tenemos numerosos intereses en común. Trabajar por la ‘unidad en la diversidad’ es una necesidad impostergable. En la Cumbre que dio vida a esta Comunidad, en Caracas, en 2011, expresamos la convicción de que ‘la unidad e integración política, económica, social y cultural de América Latina y el Caribe constituye (...) una necesidad para enfrentar con éxito los desafíos que se nos presentan como región’. Quisiera expresar mi profundo agradecimiento al presidente Danilo Medina por su sentido homenaje de recordación al Comandante en Jefe de la Revolución Cubana, Fidel Castro Ruz, en el acto inaugural de esta Cumbre, así como a todos aquellos que nos enviaron sus condolencias y mensajes de solidaridad. Permítame, para concluir, agradecerle a usted y al pueblo dominicano por la hospitalidad y cálida acogida y felicitarlos por la labor desempeñada al frente de la Presidencia Pro Témpore de la CELAC; y al mismo tiempo manifestar nuestro compromiso de apoyo y solidaridad a El Salvador y a su presidente Salvador Sánchez Cerén, en su gestión al frente de la Comunidad durante el 2017. Muchas gracias (Aplausos). By Tamara Hansen Fidel & the Cuban Revolution: How Far We Have Come On Friday January 21, 2017 Fire This Time Movement for Social Justice organized a free public forum, “Fidel & the Cuban Revolution: How Far We Have Come.” The forum reflected on the life, legacy and accomplishments of Comandante Fidel Castro two months after his passing. It was also a chance to review some of the accomplishments of poor and working Cubans throughout their triumphant and ongoing revolution. Forty people gathered at Joe’s Café on Commercial Drive in Vancouver to participate in this important community forum. The event began with videos highlighting Cuba’s response to the passing of Comandante Fidel and the importance of his leadership to the Cuban people. At the same time, recognizing the world context, videos were also shown about on the gains of Cuban women through the revolution and the future of U.S.-Cuba relations. MC, Alison Bodine, a member of the Fire This Time Newspaper Editorial board, explained that this was based on the understanding that the forum took place on the same day as the historic women’s marches in Vancouver and around the world for women’s rights in the face of U.S. president Donald Trump’s inauguration the day before. Alison also remarked that many were wondering about how President Trump might change U.S. government policies towards Cuba, so that was also included in the program. Alison invited up Thomas Davies who spoke on behalf of Fire This Time Movement for Social Justice on the ongoing antiwar movement which has been protesting under US presidents Bush, Obama and under Trump needs to continue even stronger. Brian Sproule spoke on behalf of the Communist Party of Canada Marxist-Leninist. The crowd also heard songs of resistance from local musician Zane, who shared his music in support of the rally. Zane was followed by speakers Janine Solanki who spoke from MAWO about the new era of war and occupation and the necessity to get involved in the antiwar movement, and Tamara Hansen from Fire This Time Movement for Social Justice spoke about the ruling class attempts to divide people with Islamophobia and racism, and to call for unity. Direct from the protests in Washington, DC, the rally heard from Sara Flounders who was a main organizer of the #J20Resist Washington DC protests and is the co-director of the International Action Center. Sara reported on the actions protesting the inauguration, and was able to hear the chants of support and solidarity from Vancouver’s rally. The rally closed with Indigenous activist Wanita along with her family who raised the voices of youth and future in powerful drumming and song. The rally closed with the commitment to continue educating, organizing and mobilizing against war and occupation and to demand: Resist Trump! Resist War! Resist Islamophobia! Resist Racism! Resist Sexism! Resist All Oppression! Speech by Wilfredo Peréz Bianco* Translated by Tamara Hansen To kick off Black History Month the African Descent Society BC organized a daylong "Forum on People African Descent". Mr. Wilfredo Perez Bianco, Venezuelan Consul General in Vancouver, was invited as one of five distinguished guests to speak about the gains made for Venezuelan’s of African descent by the Bolivarian revolution. His talk was met with one of the loudest applauses of the day. Fire This Time is honoured to print an extended version of his remarks. Good afternoon and thank you very much to the African Descent Society of BC for the invitation, and the opportunity to present and share experiences in this important forum, which is a free exchange for discussion, debate and defense of Afrodescendence in the world. Afro-descendants in Venezuela During the transatlantic slave trade, about 100,000 African slaves were taken to Venezuela and their work fueled an agricultural economy based on coffee and cocoa. Slavery had a deep impact on the history and demography of Venezuela and even after it was abolished in 1854, freedom did not bring equality. Racism persisted throughout the 20th century until today, and African heritage was denied with an emphasis on racial mixing. impetus for a new international order with the countries and agencies of Africa, which opened the horizon for multicentrism and pluripolarity that the Eternal Commander, Hugo Chávez, devised for the development, union and integration of peoples. Similarly, in 2016 the former Executive VicePresident, Aristóbulo Istúriz, held a bilateral meeting with his South African counterpart Cyril Ramaphosa earlier this year to discuss different economic alliances. He also held a meeting with the South African Vice Minister of Tourism, Tokozile Xasa, where they agreed on a meeting of tourism practices between the two countries, in the context of the activation of the South African-Venezuelan Joint Commission, such as promotion, services, investment and tourist hospitality. As we can see, these laws and policies promoted by the Bolivarian Government for the benefit of Afro-Venezuelan communities have had the ultimate aim of highlighting the relevance and historical significance of Afrodescendence in our country, consolidating the presence of Africanist values and the African diaspora. In conclusion, Commander Hugo Chávez, during an interview in 2005, said that “hatred against me has a lot to do with racism. By my mouth, by my curly hair. I am very proud of this mouth and this hair, because it is African.” Most recently, President Nicolás Maduro said: “We have to be proud of being from mixed heritage, it is the culture of joy, love, rebellion that faced hatred, slavery and racism”, while convening the National union in order to eradicate all forms of discrimination in the country that still exists, with the promotion of a new culture of equality, especially through the media. Long live Afrodescendence! Long live the Afrovenezolanidad! Long live Africa! Long live the Patria Grande! Thank you so much! But most people usually think, in terms of extremism, as something that is relative, related to someone they know or something that they’ve heard of, I don’t think they look upon extremism by itself, or all alone. They apply it to something. A good example—and one of the reasons that this can’t be too well understood today—many people who have been in positions of power in the past don’t realize that the power, the centers of power, are changing. When you’re in a position of power for a long time you get used to using your yardstick, and you take it for granted that because you’ve forced your yardstick on others, that everyone is still using the same yardstick. So that your definition of extremism usually applies to everyone, but nowadays times are changing, and the center of power is changing. People in the past who weren’t in a position to have a yardstick or use a yardstick of their own are using their own yardstick now. You use one and they use another. In the past when the oppressor had one stick and the oppressed used that same stick, today the oppressed are sort of shaking the shackles and getting yardsticks of their own, so when they say extremism they don’t mean what you do, and when you say extremism you don’t mean what they do. There are entirely two different meanings. And when this is understood I think you can better understand why those who are using methods of extremism are being driven to them. In the final days of his Presidential term, Barack Obama announced that two important political prisoners held in U.S. jails would be released. People around the world are celebrating the forthcoming freedom of U.S. soldier turned Wikileaks whistleblower Chelsea Manning, and Puerto Rican independence leader Oscar López Rivera. Their release is a victory which took years of tireless campaigning to achieve. Chelsea Manning served in the U.S. Army during the Iraq War. She was responsible for leaking nearly 260,000 classified U.S. diplomatic cables, as well as videos and documents. Published on the whistleblower site Wikileaks, they further exposed U.S. war crimes around the world. Chelsea was sentenced to 35 years in jail. After seven years of imprisonment Obama commuted all but four months of the 28 years of Manning’s remaining sentence. Oscar López Rivera is a Puerto Rican independence leader who has already served 36 years of a 70 year prison sentence. At the time of his capture, he proclaimed himself a prisoner of war, protected in the first protocol of the Geneva Convention of 1949. The protocol protects Lopez from prosecution for having been arrested in a conflict against colonial occupation. The U.S. did not recognize Lopez’ demand, and he served more than 12 of his 36 years in solitary confinement. Obama commuted his sentence. Both Chelsea Manning and Oscar Lopez will be freed on May 17, 2017. Despite these two positive development, Obama also blatantly ignored many other political prisoners, among them Mumia Abu Jamal and Leonard Peltier. Imprisoned since 1982, Mumia Abu Jamal has served 34 years of a life sentence for the unproven killing of a Philadelphia police officer. Amnesty International said Mumia’s trial “failed to meet international standards” due to a severe climate of racism and hostility. He suffers from diabetes and his health is constantly at risk due to improper medical treatment. Leonard Peltier was convicted for the deaths of two FBI agents who died during a 1975 shoot-out on the Pine Ridge Indian Reservation. In a trial full of discrimination and manipulations, the prosecution even conceded that they did not know who shot the agents. He has been in prison for over 41 years, with a projected release date of October 11, 2040 at the age of 96. He also suffers from diabetes, high blood pressure, and a heart condition which make the need for his immediate freedom even more important. Two important factors brought about the freedom of Chelsea Manning and Oscar López: their dedication to the social justice causes they were defending, and the ongoing campaigns demanding their release by people around the world. Both Mumia and Leonard have shown their incredible spirits of resistance, and we must continue to support the ongoing international campaigns demanding their freedom. FREE LEONARD PELTIER NOW! FREE MUMIA ABU JAMAL NOW! FREE ALL U.S. POLITICAL PRISONERS NOW! CHICAGO.—With the visit by three Cuban experts to the city of Chicago, a collaboration project between the University of Illinois and the Cuban Ministry of Public Health (MINSAP) began this week, as part of which Cuban and U.S. professionals will work to evaluate health care for vulnerable and low-income communities in the city of Chicago, in order to suggest measures to contribute to improving their health indicators. The visit will extend through January 13, and marks the beginning of a joint work program, the first stage of which will last approximately one year and will be focused on maternal and child care and on cancer screening and prevention, according to a press release from the Cuban Foreign Ministry. During their stay in Chicago, Cuban doctors Sonia María González Vega, director of Primary Health Care in the municipality of Camagüey; José Armando Arronte Villamarín, Provincial Health director in Las Tunas, and Carlos Calvis Cabrera, coordinator of the island’s International Medical Brigades, will exchange with representatives of health centers, universities and other community actors on the experiences and strategies of the Cuban health system, based on preventive medicine. Regarding the project, Dr. Robert A. Winn, associate vice chancellor for community-based practice and director of the University of Illinois Cancer Center, stated the hope to work with Cuban professionals “to identify the medical practices that have worked for them, while allowing them to observe some of the ways we deliver health care that may be very different from how they operate, in the hopes that this exchange will lead to improved health for populations in both our countries”. The public housing program is either free or low of cost, depending on the family’s means. In another message, he said that despite the economic war and the drop of over 70 percent in crude oil prices, his government has not stopped investing in social care policies. “In 2016, foreign exchange earnings fell by 87 percent and we built twice as many new homes for our people. Doing more with less. (We are) succeeding,” he said.